There are now more ways available for people to communicate than ever before. Thanks to mobile technology and robust wireless networks, anyone with a mobile phone can place a call, send a text, check their email, respond to social media messages, and take and send photos and videos from just about anywhere. However, many healthcare providers communicate primarily by phone and voicemail, even though patients would like to communicate in more convenient ways with their providers. But text messaging has proven difficult for healthcare practices to adopt both from a privacy standpoint (maintaining HIPAA compliance) and from a practical standpoint. Texts aren’t captured by practice management or electronic medical record (EMR) systems, and ensuring prompt responses can be difficult if the texts are coming to a busy provider’s phone. Practices often create convoluted workarounds that involve manual data entry so patients can text the office and still have those messages remain part of the medical record. Administrative staff may have to monitor a dedicated mobile phone in addition to email and patient portal communications. Patients, on the other hand, prefer texts to phone calls. Other types of electronic communication via patient portals, mobile apps, or secure email often aren’t embraced by patients because they require additional steps or passwords. Two-way communication between patients and providers can be improved by making text messaging something that’s easy for patients to adopt and use on a regular basis. An integrated solution that can work with existing practice management and EMR solutions and that is also patient-friendly and fits within the practice’s workflow can improve patient convenience and contribute to cost savings for the provider. 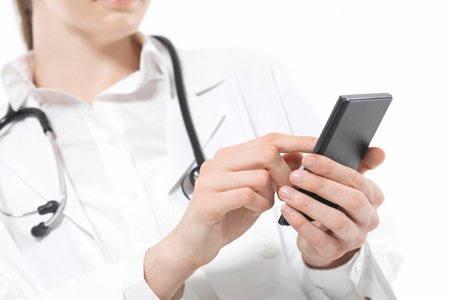 Texting can improve patient outreach in a number of ways. Patients would like to be able to contact their providers via text with questions and receive appointment reminders and scheduling information on their mobile phones. This can eliminate the need for phone calls, being placed on hold, or playing lengthy games of phone tag just to schedule an appointment or find out if their lab results have arrived. For providers, texting potentially represents a better way to issue alerts and reminders, ensure an optimized schedule, reduce no-shows, and improve the ability to fill last-minute schedule vacancies. Texting via a solution that is integrated with the practice’s patient database and that can be easily tracked within the medical record can also save time and money. A typical multi-physician practice receives hundreds of calls per day at a cost of up to $20 per call, and none of it is reimbursed by payers. Those calls can be converted to SMS messages that cost pennies to handle. Messages and alerts can be configured to provide automated appointment reminders and collect confirmations, without any intervention by administrative staff. Many practices have introduced texting solutions, but they have significant limitations. Even with existing automated texting solutions, messages, appointment reminders, and confirmations often come from an unknown short code. While it’s perfectly normal for a patient to receive a text and assume they can respond to it with questions or other information, that is not possible with many healthcare practice texting solutions. Patients may be forced to respond to the solution using specific responses (yes, no, etc.) or have no way to respond at all. For those solutions that do allow free-form responses, historically those messages are re-routed as emails and sent to an account at the practice that has to be manually monitored. Administrative staff have to check the email account for updates and determine how to reply. In many cases, the texting solution is not integrated with the practice’s other healthcare software systems, so staff must re-enter patient contact information that is already in the practice management or EMR solution. In some cases, practices purchase a company cell phone to text patients, and staff are assigned to read and respond to text messages as they arrive. There are also limits around what types of information can be communicated through text messages. For example, protected health information (PHI) is generally not allowed to be texted under federal regulations, however many day-to-day patient communications can be conducted via text. An approach to text communication that is more friendly to both practices and patients can enable a number of cost, time, and convenience benefits. The texting solution should be integrated with practice management and EMR information so staff don’t have to double-enter patient contact information, and so text messages can be easily included in the patient record. Such a system can provide patient-specific context to the text exchange that includes scheduling and other appointment information, while simultaneously improving documentation of patient contacts. With an integrated approach, administrative staff can easily send messages from their desktop systems to specific patients or to a mailing list of patients in SMS format. A portion of the practice’s landline is provisioned for text messages under this model. Staff see these conversations in chat-like windows, while the communication looks like a typical text exchange to the patient. Patient convenience: Patients can receive communications in their preferred format without having to log in to a portal or download a mobile app. They can quickly confirm or reschedule appointments, and also initiate texts to the practice with questions or concerns. Responsiveness: Administrative staff can receive automatic alerts on their desktop when new messages are received so they can respond immediately. Data is synchronized with the patient information in the EMR system, so the practice knows which mobile devices are associated with which patients, and where a text originated. Fewer schedule gaps: If there is an opening in the schedule, a list of patients can be alerted to provide ASAP scheduling capabilities. This is an excellent alternative to phone calls, because every patient on the waiting list can be contacted simultaneously, and they can immediately respond without having to dial in to the office. Data analysis: An integrated texting solution can also provide additional insight and intelligence at the patient level for the practice. Practices can track response rates, flag frequent no-shows, and identify groups of patients that need more frequent reminders. The texts can be sorted and prioritized based on custom criteria. Practices can determine which texts need immediate responses and flag them so the team addresses those first. Practices can evaluate the patient population and prioritize different groups of patients for reminders. For example, patients who are overdue for appointments or who have outstanding balances can be contacted more frequently. Documentation: All ongoing interactions, including texts, emails, and phone calls, can be tracked and are viewable in one place. Improved care: Practices can establish texting programs and configure reminders for patients with particular disease profiles. If a patient with a serious condition has not been seen for a certain length of time (a parameter that can be customized), the system would automatically issue appointment reminders and potentially alert staff to follow up with a phone call. There will still be limits to what patients and healthcare providers can discuss via text because of HIPAA and other regulations around PHI. However, with a fully integrated texting solution, any discussions that involve diagnosis, procedures, or other sensitive information can be automatically ported over to a more secure channel such as secure email, web browser chats, the patient portal, or a phone call. Patients want the flexibility to receive, send, and reply to text messages from their healthcare providers. Practices can benefit from a texting solution that does not require manual intervention to react to patient requests, and that can help improve recall rates and scheduling. A texting solution that is integrated with the practice’s other software systems can help eliminate the need to re-key patient contact information. These solutions also include features that allow staff to sort and prioritize incoming messages, access full conversation histories, and quickly remind patients about appointments or alert them to openings in the schedule. More importantly, text messaging is the preferred communication method for most consumers. Patients want the convenience of receiving reminders, responding to them, and asking questions of their healthcare providers via a technology they already use. For busy practices looking for a way to reduce costs, streamline scheduling processes, and improve patient relations, an integrated texting platform can be a critical communication tool.